Be part of the cast in an interactive film epic! Directed and filmed Tuesdays and Thursdays from 3pm to 5pm. Special thank you to Rick Raguso who put countless hours into making Wondermare a reality, and Phyllis Bickham, for her tireless camera work and enthusiasm. Stories allow us collectively and as individuals to safely "play" within narrative structures. The characters on screen, in a book, on a stage—particularly when we are children—become extensions of our collective fantasies enacting both our fears and desires. They stay with us, almost as ghosts in our subconscious, resonating throughout our dreams and experiences, often defining our "real" life construction of what reality entails. 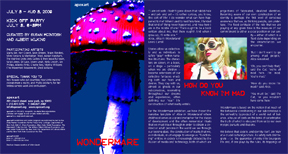 For the Wondermare exhibition, we have chosen the narrative template of Alice in Wonderland where childhood serves as a grand metaphor for the stages of development and the often nonsensical rituals that we must travel through in order to obtain a civilized or adult persona in the world we see through our looking glass. The construction of reality that we, as individuals, must engage to emerge as "functioning" entities in society is increasingly dictated by the illusion of media and technology, both of which are projections of fabricated, idealized identities. Becoming aware of our own construction of an identity is perhaps the first level of conscious awareness that we, as thinking people, can undertake. The fixed certitude of the role that we are playing at any given time is the measure of our commitment to either a social position or our sanity—either of which is a fluid state depending on the circumstances we encounter. Wondermare is based on the notion that much of the behavioral conditioning in our subconscious is the unhealthy byproduct of a world out of balance, a house of cards on the brink of catastrophe; the truth of which is obscured from us by our own myopic pursuits and illusions. We believe that society, and identity itself, are truly at a crucial cultural juncture. As safety nets disintegrate—i.e. the guarantee of entry into bourgeois life and, if one plays by the rules, its trappings of financial security—prove to be mere illusions and such constructs of "lifestyle and luxury", in their excessive nature, continue gambling with the future of the planet and all living species that inhabit it. The prominent question then is what role will you choose to play in the grand scheme of this consumptive "tea party"? Perhaps you are Alice, a naïve child/woman who wraps herself in consumer goods and the protective gendered power of passive subjectivity. Or maybe you are the Mad Hatter, the bad boy enabler who gloriously advocates addictive destruction; or the Red Queen, a sadist who revels in the servitude of subordinates who languish in their own lack of personhood. Or maybe you are the Rabbit, someone who pursues their identity through technological masks and veils, whose interactivity shields them from real human interaction and the messy byproducts of emotional entanglements. Do you see yourself as the Mother/Duchess, a role either chosen or forced upon you due to the state of one's biological or cultural determinism? Or maybe you're the zealot: the Muslim, the Jew, the Christian, the Cop, the Revolutionary, the one who immerses their identity in favor of an ideology, a dogma that obscures their need for questions concerning one's own place in the social hierarchy. It is the task of the new hero and heroine to navigate these roles and unfamiliar channels and at last emerge from this illusion forging a new personal and social consciousness. As such, Wondermare will seek to unravel these narrative notions by asking you, the gallery visitor, to become a participant in your own story, choosing to play one of the above characters or one of your own and allowing your voice to emerge through the process. We ask you to "pick a card," and answer a question against a live camera in front of a green screen. The green screen will allow us, in a final edit, to place you anywhere and against any backdrop. The narrative of the story will no longer stay fixed and instead a new plot will be enabled as you become the star and a new film emerges from each interaction. As you become part of this video installation, Wondermare will ask you to reexamine and redefine your relationship to the world and the stories you have spun, internally and externally. Immersed in an eight-screen video landscape, you will feel compelled to address the parts of yourself that are hidden, repressed and denied. As an interactive exhibition, the show creates the opportunity for a psychological rebooting or do over, where you will have another chance at addressing your own rights of cultural passage that you may or may not have gotten right the first time around. 'I'm afraid I am, sir,' said Alice. It is time to fall down a rabbit hole, to play a new role and forge a commitment to a different reality. Susan McIntosh was born and raised in San Francisco where she attended UC Berkeley and majored in dead Irish poets. After graduating she moved to London and worked for a record company gathering "research" on a wide variety of dialects that later translated into a standup act. After being deported, she attended the MFA film program at Columbia University. The short film she produced there took her around the world and won the New York division of The Student Academy Awards. For her thesis she made a feature film about a pair of star-crossed circus freaks. The script won a Panavision Young Filmmakers Award. After graduation she was signed to ICM and later Writers and Artists, optioning screenplays to Senza Films and Delornra Films. McIntosh has worked developing shows with both IFC and Bravo. She created a one-person show, "Midnight in Brooklyn," whose characters went on to star in an MTV promotional campaign and premiered on the 2005 VMA's. At the Fishtank Gallery in Williamsburg, Brooklyn in 2002, she was awarded a solo show and installation. She chose to construct a Victorian set and create a play based on the writings and letters of Oscar Wilde. She played Oscar. The work was later presented at The National Arts Club by the Junior Committee. Most recently McIntosh had a sold out one-person show at The Edinburgh Fringe Festival called "Spawn and Die." Albert Wilking was born in Anaheim, California near Disneyland to a photographer painter mother and inventor father. Wilking lived an early bohemian life traveling and camping all over the west coast, New Mexico and Texas before moving to New Brunswick, NJ. Daytrips were common to Soho and to abandoned barns along the Delaware. At the age of seven he began sketching on a regular basis. With his father's encouragement he had a number of shows and sold a couple dozen paintings by the time he was 12, garnering press including The New York Times. Wilking received a BS from the College of New Jersey. He attended the New School University, NYC, for screenwriting and Pratt Institute, NYC for Flash animation. In 2002 the Queens Museum in New York City acquired two of his paintings through the Monique Goldstrom Gallery, Soho, NY. In 2006 Wilking formed Crazy Studios, turning his love of painting to video and writing. He has produced over fifty viral videos, garnering attention from web junkies across the world. In 2008 he partnered with Susan McIntosh to produce their pilot.